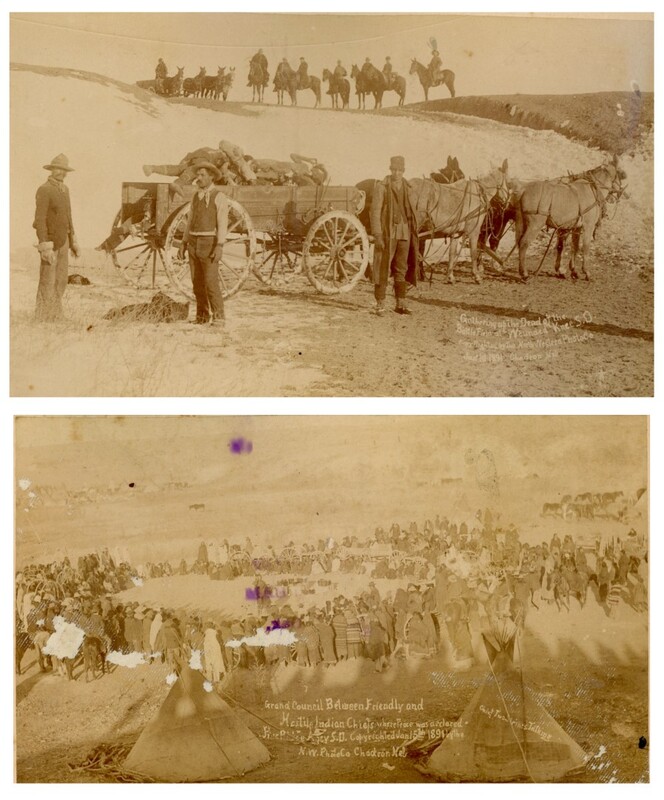 Two original albumen photographs from 1890 and 1891, taken by Northwestern Photo Co. of Chadron, Nebraska, whose company is well known for documenting the aftermath of the Wounded Knee massacre. 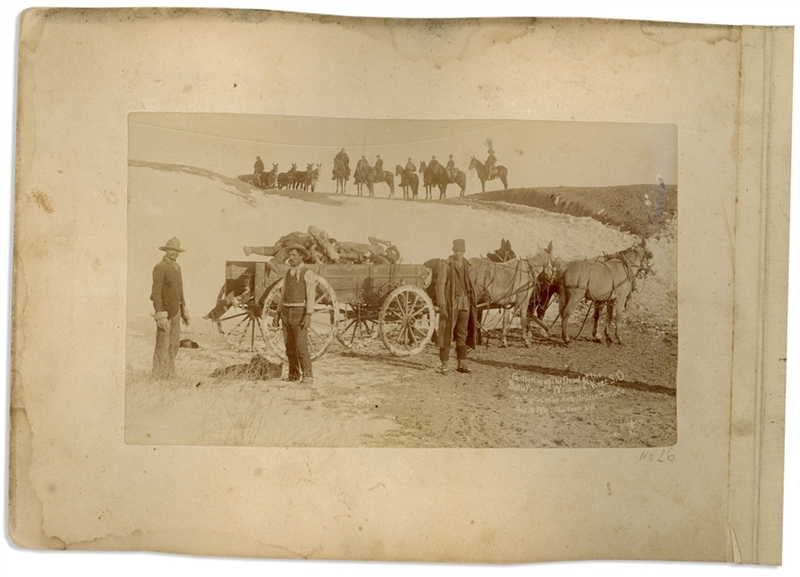 One of the photos shows dead Lakota Sioux being hauled away in a wagon with the following caption in the negative, ''Gathering up the Dead at the BattleField at Wounded Knee S.D.'' The photo is also published in ''Eyewitness at Wounded Knee'' where it's written, ''The burial party collected the dead from the ravine south of the Indian camp where many had sought shelter. Army officers look on.'' The second photo, on the verso, shows the ''Grand Council Between Friendly and Hostile Indian Chiefs''. 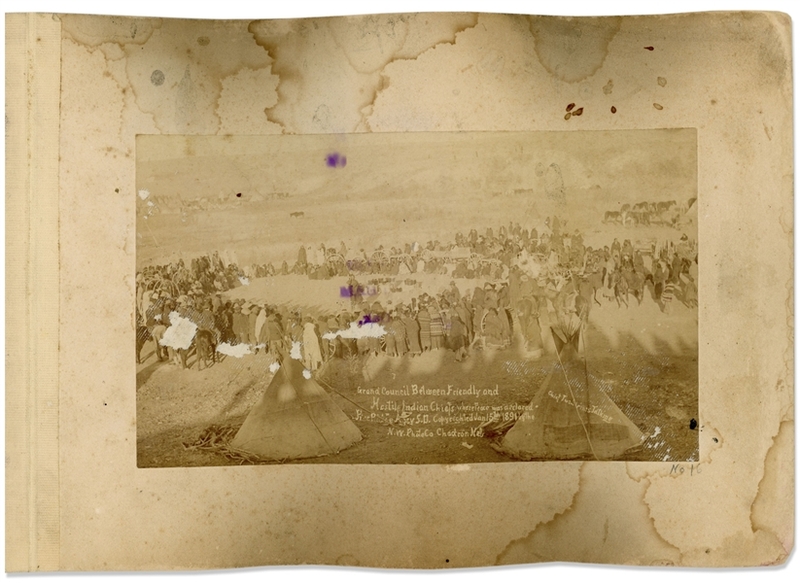 Also published in ''Eyewitness at Wounded Knee'', the situation is described, ''General Miles enlisted the aid of several Indian leaders to induce the surrendered Ghost Dancers to give up their weapons. A council was held on January 17 , during which the Indians expressed their opinions on disarmament. Speakers included Kicking Bear, Two Strike, Young Man Afraid of His Horses, American Horse, Short Bull, High Pipe, and Standing Soldiers. The only whites invited to speak were Lieutenant Taylor of the Indian scouts and ex-agent Valentine T. McGillycuddy. When the council concluded, only 104 guns were surrendered, but by the end of the month even the more belligerent dancers would concede to Miles's demands.'' Photos measure 7'' x 4.25'', affixed to an album mat measuring 10'' x 7''. Some buckling and staining to mat. Photos are a bit light, and Sioux conference photo has some abrasions at center left. Good condition.